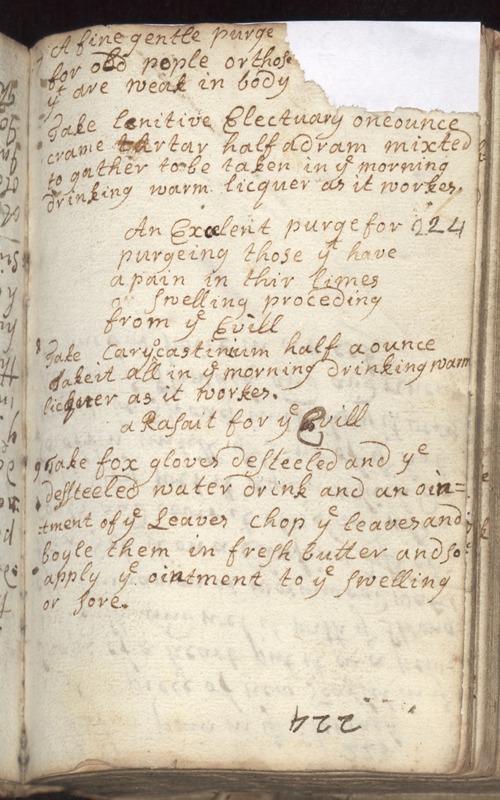 A fine gentle purge for old people or those yt are weak in body Take lenitive Electuary one ounce crame tartar half a dram mixted to gather to be taken in ye morning drinking warm licquer as it workes. An Excelent purge for purgeing those yt have a pain in their limes or swelling proceding from ye evill. Take Caryocastinium half a ounce Take it all in ye morning drinking warm licquer as it workes a Rasout for ye Evill Take fox gloves desteeled and ye dessteeled water drink and an ointment of ye Leaves chop ye leaves and boyle them in fresh butter and so apply ye ointment to ye swelling or sore.